Recent additions to the Antique Cufflink Gallery include dazzling Art Deco diamond cufflinks, fierce lion-eagles by Carter, Howe & Co., striking black-and-whites and intricately engraved diamond cufflinks circa 1920. This month the Antique Stickpin Gallery has gone to the birds with a proud pheasant and wise owl. A French chimera and Brassler scarab round out the offerings. Recent additions to the Antique Dress Set Gallery include two elegant Art Deco dress sets by Carrington & Co. - one set with shimmering moonstones the other with luminous mother of pearl. Frosty Art Deco diamond cufflinks, circa 1930. Last month I celebrated the warm colors of autumn with gold and sapphire cufflinks. Since then we have had our first snow fall, the skies have turned a little greyer and the air is a little chillier. All signs that winter has come to New England. To announce the arrival of the season here is a flurry of frosty white Art Deco cufflinks. Carter, Gough platinum snowflakes, circa 1930. Shimmering snowflakes falling in frosty platinum skies. These cufflinks sparkle with the cool elegance and striking geometry of the late Art Deco period. 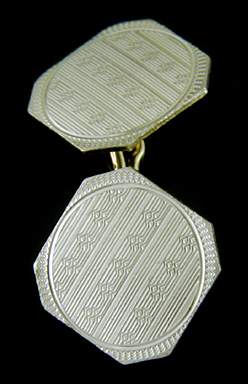 Created by Carter, Gough & Co. in platinum and 14kt gold, circa 1930. 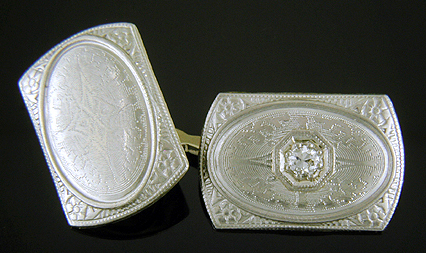 Intricately engraved diamond cufflinks, circa 1920. Intricately engraved centers and borders of stylized flowers and abstract linear motifs help date these cufflinks to the early Art Deco period. This style of finely engraved, richly detailed cufflink echoes the cufflinks of the earlier Edwardian period. Crafted in 14kt white gold, circa 1920. Hookaylo elegant wintry cufflinks, circa 1925. These glimmering Art Deco cufflinks bring to mind the wintry elegance of frosty window panes glittering in the early morning sun. Created in 14kt gold by Jacob Hookaylo, a gifted jewelry designer and goldsmith based in Newark, New Jersey during the Art Deco period. A flurry of snowflakes and sapphires, circa 1925. Another pair of Jacob Hookaylo cufflinks. Here a flurry of snowflakes swirls around bright blue sapphires surrounded by jazzy Art Deco borders of alternating involute scrolls and linear motifs. Crafted in 14kt gold, circa 1925. Pinstripes and confetti, circa 1925. Elegant pinstripes and radiating waves in the corners give these cufflinks a festive, energetic feel. A small, repeated geometric pattern floats above the pinstripes like glittering confetti floating down from a ballroom ceiling on New Year's Eve. Crafted in 14kt white and yellow gold, circa 1925. Mesmerizing diamond cufflinks, circa 1925. Mesmerizing cufflinks with richly engraved centers and intricate geometric borders. Small diamonds are set in box settings with millegrain edges. A miniature masterpiece of Art Deco design created by L. Fritschze & Co. in 14kt gold, circa 1925.
and the coming new year. Recent additions to the Antique Cufflink Gallery include several pairs of Art Deco cufflinks set with bright blue sapphires, an elegant Carrington dress set, striking guilloche enamel cufflinks by Krementz and a number of other richly engraved cufflinks from the early 20th century. In the Antique Stickpin Gallery recent additions include a fierce dragon, a golden bug and a lapis lazuli scarab. Regal Dragon A fierce dragon watches menacingly while maintaining a certain regal composure. The dragon is beautifully rendered - note the fine details of the wings, the scales along the neck and body and the expressive features of the head. Crafted in 14kt gold, circa 1900. The Gold Bug The diamond-set head, elongated shield-shape body and golden forelegs of this abstractly rendered insect are framed by dramatically outward sweeping wings. A wonderful example of American Art Nouveau design. Crafted in 14kt gold, circa 1900. 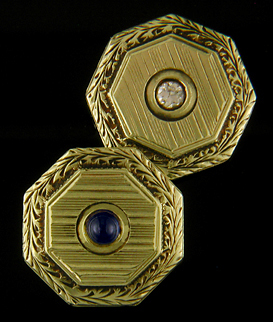 Carter, Gough sapphire cufflinks, circa 1920. Cool, crisp mornings, clear blue skies and the rich gold tones of turning foliage announce autumn in New England. It is little wonder that my thoughts this time of year often turn to antique cufflinks decorated in the same elegant pairing of blue and gold. 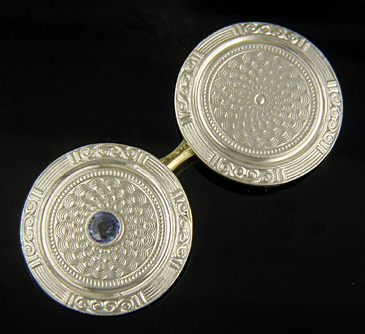 So, in the spirit of the season below is a brief survey of gold cufflinks set with bright blue sapphires. 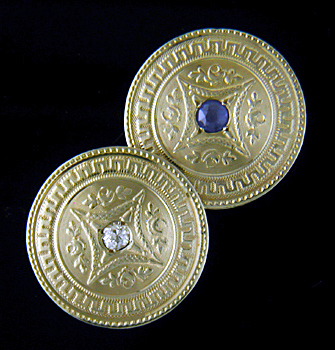 Ehrlich & Sinnock sapphire cufflinks. 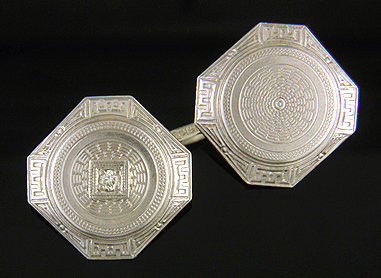 Early Art Deco cufflink makers rarely missed an opportunity to richly embellish a design with fine, intricate details. Here rich blue sapphires are set amid bright gold concentric circles, stylized acanthus leaves and finely milgrained edges. Crafted in 14kt gold, circa 1925. Platinum borders with stylized lotus blossoms and splayed papyrus fronds. The yellow gold centers of the cufflinks feature smaller lotus blossoms surrounding on one side a bright blue sapphire set in platinum and on other a radiant sun burst motif. The discovery of Tutankhamen's tomb in 1922 inspired the Egyptian Revival style of the Art Deco era. Crafted in platinum and 14kt gold, circa 1925. Charles Keller sapphire and diamond cufflinks (I). A wind or compass rose surrounds diamonds and sapphires while stylized roses, a dentil meander and milgrained edges swirl around the periphery. 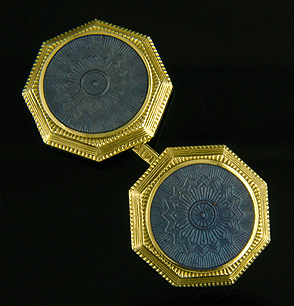 An elegant example of the richly detailed cufflinks created by Charles Keller & Co. in the early 1900s. Crafted in 14kt white and yellow gold, circa 1925. 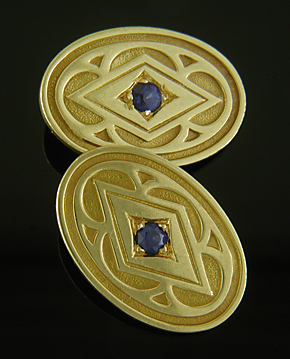 J.R. Wood Gothic sapphire cufflinks. The architecture of the Gothic era is reflected in the design of these elegant gold cufflinks set with bright blue sapphires. The nested ovals, quatrefoils and navettes (diamond shapes) bring to mind the elaborate stone tracery surrounding stained glass windows in a Gothic cathedral. Created by J.R. Wood & Sons in 14kt yellow gold, circa 1920. Charles Keller sapphire and diamond cufflinks (II). Sparkling diamonds and rich blue sapphires surrounded by foliate wreath borders and dramatic pinstripe centers. The classic elegance and timeless beauty of the antique cufflink. Created by Charles Keller & Co. in 14kt gold, circa 1920. Jacob Hookaylo frosty sapphire cufflinks. A maelstrom of swirling snow surrounds a bright blue sapphire. This wintry tempest in a cufflink is framed by a jazzy border of alternating Art Deco scrolls and linear motifs. Although breaking with our theme of sapphires set in yellow gold, this pair of cufflinks is an elegant reminder that the New England autumn is followed by the frosty beauty of winter. Created by Jacob Hookaylo in 14kt gold, circa 1925. Recent additions to the Antique Cufflink Gallery include elegant guilloche enamel and diamond cufflinks by Whiteside & Blank, striking sapphire and diamond links, frosty platinum and gold snowflakes and an Art Deco pair featuring blue enamel and golden pinstripe. In the Antique Stickpin Gallery recent additions include a fiery French chimera from the Art Nouveau era. Whiteside & Blank blue guilloche enamel cufflinks. One of the pleasures of antique cufflinks is exploring the great variety of decorative techniques used in their creation. 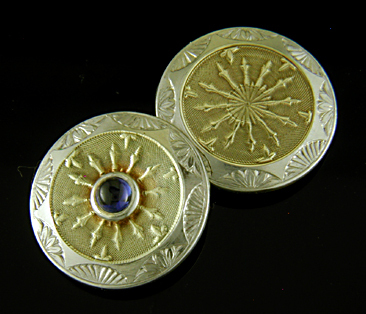 Among the rarer and more beautiful cufflinks are those decorated with guilloche enameling. Guilloche enamel brings together two venerable and exacting arts - enameling and engine turning. Enameling is the art of fusing powdered glass onto a metal or other substrate. As the powdered glass melts and cools it forms a lustrous vitreous surface. Enameled jewels date back to the ancient Mycenaean civilization of Cyprus. 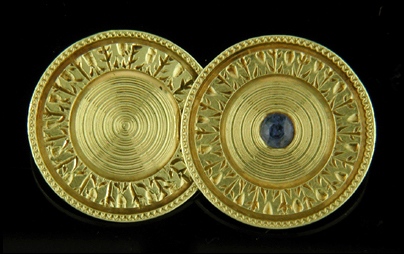 The Mycenaean ornaments (sorry, no cufflinks were found) date to the 13th century BC. The beautiful blue enamel cufflinks pictured at the top of this note are a little more contemporary. They date from around 1920 and were created in the jewelry workshops of Whiteside & Blank. Beautifully engine-turned platinum cufflinks by Carrington. Engine turning (or guilloche) is the art of mechanically engraving intricate, repeating designs on a metallic or other surface. Among the common guilloche patterns are shimmering radiant stars, wavy lines and spirals, pinstripes, concentric circles and other figures. The Carrington cufflinks pictured above are a beautiful example of the engine turner's art with jagged radiating curves surrounded by an equally intricate border. The depth and fineness of the engraving gives the design a striking three-dimensional appearance. The allure of the machine - a rose engine lathe, circa 1800. 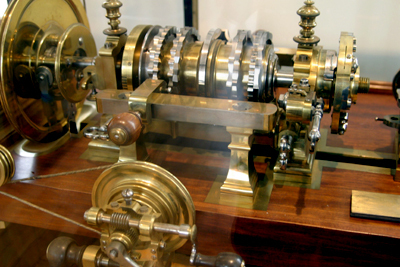 The art of engine turning emerged in Germany during the early 1500s with the invention of the rose engine lathe. 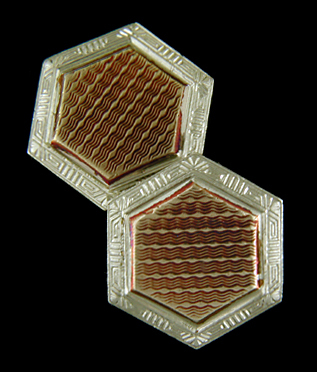 Initially applied to softer materials like ivory, the technique was soon adapted to create elaborate designs on metal and glass. At one time in Germany engine turning (or "rose turning") was an enthusiastically pursued pastime of rulers and noblemen. The rose engine lathes, themselves, are beautifully crafted machines that are as intriguing and intricate as the designs they create. 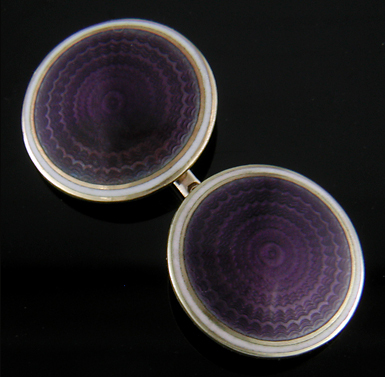 Carrington purple guilloche enamel cufflinks. When an engine turned surface is covered with a layer of translucent, colored enamel magic occurs. The colored enamel pools in the valleys of the engraved lines mirroring the engraved design in rich color. Subtle variations in the depth of the engraving are reflected in the shading of the color and the engraved pattern is thrown into stunning relief. The effect is mesmerizing. Carrington blue-gray guilloche enamel cufflinks. The enthusiasm for guilloche enameling during the late 19th and early 20th century was sparked by the creations of the master Russian jeweler Peter Carl Faberge. Faberge and his work masters created a dazzling array of enameled jewels and objets d'art. In doing so they elevated the arts of engine turning and enameling to new heights. Among Faberge's many enameled creations were cufflinks, desk accessories and the famous Faberge Easter Eggs. 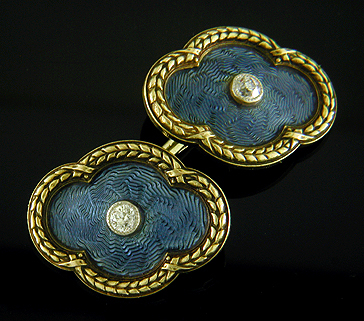 The above Carrington cufflinks may have been inspired by Faberge's work. The subdued blue-gray enamel and classic canted-corner shape of the cufflinks recalls the elegant jewels of the Russian master. They illustrate the simple, elegant designs favored by Carrington & Co. and the firm's uncompromising commitment to craftsmanship. William Huger blue guilloche enamel and gold cufflink. Equal to Carrington & Co. in creating beautiful guilloche enamel cufflinks was William Huger & Company. Of the two firms Carrington was the more prolific. But what Huger lacked in production numbers the firm more than made up for with the beauty of its designs, as illustrated by the above exquisite example. The above Huger cufflink features an intricately engine-turned pattern wedded with light blue enamel. The effect is like exploding blue fire works in a dark evening sky. Gold borders of foliate and geometric scrolls frame the enamel centers. Krementz & Co. guilloche enamel cufflink. 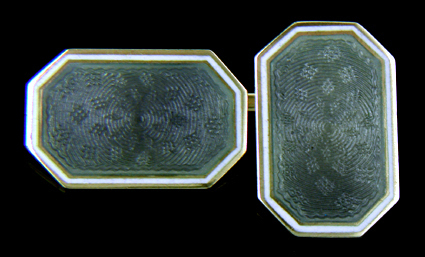 To close, I offer three more examples of guilloche enamel cufflinks. Two of the cufflinks are from small batch makers (Jacob Hookaylo and Taylor & Co.), firms that like William Huger created extraordinarily beautiful cufflinks, but only in limited numbers. The expression "small batch maker" is in analogy to the distillers of fine, but limited run, bourbons and ryes. The other cufflink (above) is by Krementz & Co., a prolific and seemingly ubiquitous manufacturer of fine cufflinks during the late 19th and early 20th century. Jacob Hookaylo guilloche enamel cufflink. Taylor & Co. guilloche enamel cufflink. please visit the Antique Cufflink Gallery. I have had a very busy month acquiring antique cufflinks, stickpins and brooches, but unfortunately only had time to add a beautiful Art Nouveau brooch in the Antique Brooch Gallery. Art Nouveau Amethyst The amethyst rests between the flowing wings of an exotic butterfly or bat. Beneath the amethyst a small pearl glows like a distant full moon. Created in 14kt gold, circa 1900. Among the recent acquisitions are beautiful guilloche enamel cufflinks, a striking French chimera stickpin and several elegant dress sets set with colored gemstones. These and other fine jewels from the past will be added to the antique and estate jewelry galleries in the next few weeks. So stay tuned! Winged Bridge Maker cufflink, circa 1925. One of the delights of antique cufflinks is exploring the history and discovering forgotten works of the jewelers who created these miniature master pieces. Over the past 150 years firms creating fine jewelry in the United States have numbered in the hundreds, if not more. No doubt a large percentage of these jewelers created cufflinks. In several earlier notes (see list below) I wrote about the cufflinks of one of the more mysterious of these talented makers ... the Winged Bridge Maker. Nicknamed for the distinctive wing-like bridges that unite the ends of the cufflinks, this maker created beautiful white and yellow gold cufflinks during the early Art Deco period. The cufflinks sparkle with the exuberance of the Jazz Age featuring finely engraved centers surrounded by bold geometric and foliate borders. 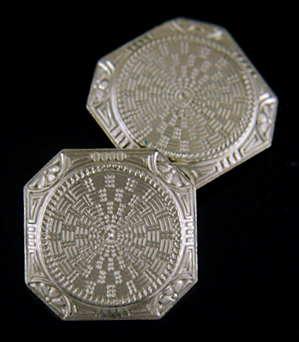 Reverse of cufflinks by Winged Bridge maker. The cufflinks are identified by the distinctive winged bridges, as well as the quality of the craftsmanship, beauty of the center engraving and bold border work. However, beyond that there are no maker's marks or other clues to the identity of the Winged Bridge Maker. The only marking on the bridges is "14K" for the purity of the gold. 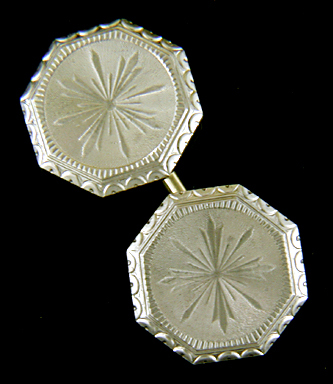 Until recently, the maker of these elegant cufflinks has been unidentified. Jacob Hookaylo cufflink, circa 1925. The mystery of the Winged Bridge Maker was solved with the help of the above cufflink. 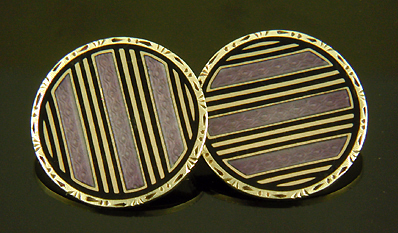 Beneath a shimmering layer of dark magenta enamel this cufflink is identical to the example pictured at the beginning of this note. They both have yellow gold centers finely engraved with a pattern of wavy lines creating an optical illusion of stacked boxes. They both have white gold borders with geometric motifs and radiant palmette corners. The enameled cufflink was created by Jacob Hookaylo, a jeweler of Ukrainian descent who immigrated to the United States and founded a self-named jewelry workshop in Newark, New Jersey around 1920. The cufflink at the beginning of this note is attributed to the Winged Bridge Maker. Reverse of Jacob Hookaylo cufflink. On the reverse of the enameled cufflink a winged bridge connects the two ends. The center of the bridge is stamped with the maker's mark of the Hookaylo firm - and "H" within a lateral paralellogram. The bridge of the signed cufflink is angular with hints of Greek key and other geometric motifs. The bridge design reflects the Art Deco style of the 1920s. The bridges of the unsigned cufflinks are more flowing with an Art Nouveau sensibility. 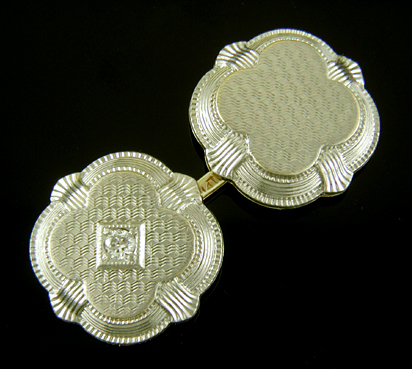 However, both cufflinks clearly date from the 1920s as indicated by the use of white gold. The changing bridge design, as well as the introduction of enamel work, may reflect the evolution of the Hookaylo firm as it adapted to the changing fashions of the Jazz Age. 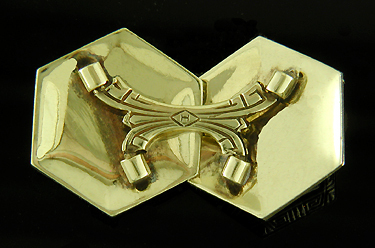 Jacob Hookaylo "Winged Bridge" cufflink, circa 1925. Based on the above, I believe that the Hookaylo firm created the cufflinks previously identified as work of the Winged Bridge Maker. In short, Jacob Hookaylo is the Winged Bridge Maker. Of course any such attribution warrants several caveats. Identifying Jacob Hookaylo as the Winged Bridge Maker is, at this time, based on a single pair of signed cufflinks which strongly resembles a pair of cufflinks attributed to the Winged Bridge Maker. As other signed pairs come to light or if documentary evidence is found (for example Hookaylo trade catalogs, receipts, design patents, etc...) the attribution will be strengthened. Currently little is known about Jacob Hookaylo and the firm he founded. Given the beauty of the cufflinks, further research into the firm and its founder would be well worth the effort. A second caveat regards the maker's mark. Jacob Hookaylo was not the only jewelry maker to employee a maker's mark with an "H" inside a parallelogram. Dorothy Rainwater's invaluable reference, American Jewelry Manufacturers, identifies two other jewelry maker's with similar marks - Haltom Industries of Ft. Worth, Texas and J&L Hartzberg of New York City. Haltom Industries was founded in 1948 and employed an "H" in a square diamond shape as its maker's maker. The dissimilarity of the maker's mark and the date of the firm's founding preclude it as the maker of the above enameled cufflink or as a candidate for the Winged Bridge Maker. The second firm J&L Hartzberg is a more interesting. Dorothy Rainwater identifies John and Louis Hartzberg as "manufacturers of platinum jewelry" and trade references indicate that the firm was active during the 1920s. During this period in the United States the hand-crafting of platinum rings and other jewels for important diamonds and colored gemstones was based in New York City. I suspect that J&L Hartzberg participated in this trade. It seems unlikely that the firm was involved in the manufacture of cufflinks, although until the Hookaylo attribution is strengthened this always remains a possibility. As always there is more research to be done!